Skin care is certainly a hot topic among beauty and makeup insiders. After all, taking care of your skin creates a better canvas for those amazing makeup tutorials that mesmerize us on Instagram and YouTube. If you’ve spent any time poking around on either app, you’ve definitely heard of coconut oil. With a deeper dive into the beauty realms and you may have also heard about argan oil, jojoba oil, sweet almond oil, avocado oil, and even olive oil (right from the pantry!) being used for all natural skin care DIYs. Why though? Well, these types of beauty oils are all-natural oils derived from plants and they’re loaded with beneficial stuff for your skin (and hair, but that’s another topic). They go way beyond moisturizing to deliver various nutrients that keep your skin looking beautiful and there’s no harsh chemicals to worry about. This one is probably the most obvious way to use beauty oils as part of any system of all natural skin care. Moisturizing is all about replacing the water your skin naturally loses and adding to your skin’s natural barrier to keep water in. Oils by themselves (even all natural ones) can’t add water to your skin. What they do best is add to your skin’s natural barrier by replenishing fatty acids instead of using harsh chemicals or ingredients that leave behind a greasy residue. This means everything for all natural skin care enthusiasts! You could apply a master hydrator like hyaluronic acid or aloe vera, followed by a natural beauty oil. Or simply apply the beauty oil of your choice after showering while your skin is damp and plumped up with water. At first glance, using oil to cleanse your face may seem counterintuitive or like some weird social media fad. However, unlike traditional cleansing products that tend to strip away natural oils, beauty oils help bring balance to your skin. Here’s how to do it: First use a makeup wipe or makeup remover to remove excess product from your face. Next, cover your face in an all natural beauty oil— we recommend jojoba or rosehip oil. Microwave a clean damp cloth for 30-60 seconds until it is as hot as is comfortable for you to touch. Lay the damp cloth over your face (this adds water to your skin), and relax until the cloth is completely cool. Use the cloth to wipe away any excess oil and it’s honestly amazing how soft and smooth skin feels! It’s a phenomenal way to start the day because your skin is perfectly primed for makeup application too. For anyone just getting started on developing their own all natural skin care routine, this is an easy yet effective technique. You may even find you can drop traditional cleansers, moisturizers and makeup primers altogether. Many people turn to all natural skin care routines because they have sensitive skin or very specific allergies. Of course there are many fantastic gentle or all natural skin care products that do very well for sensitive skin but making your own gives you that much more control. Adding pure organic beauty oils to your all natural skin care wishlist is the absolute best place to start. 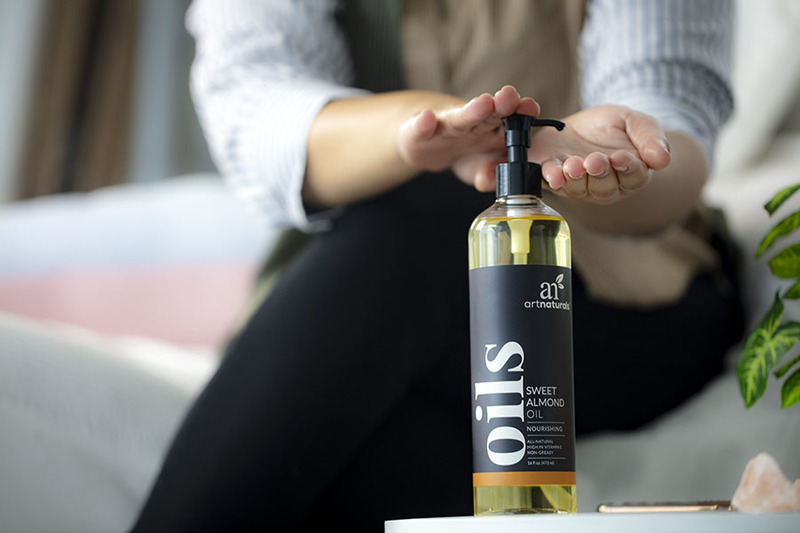 Natural plant based oils are full of nutrients and the fatty acids your skin needs, plus as carrier oils they’re ideal for incorporating essential oils in your all natural skin care recipes. We’re obsessed with avocados, and not just in delicious guacamole! Fresh avocados are wonderful for all kinds of all natural skin care recipes… and they’re even better with a boost from organic cold-pressed avocado oil. We love this recipe because it hydrates, nourishes, softens and brightens. It’s the perfect weekly addition to your all natural skin care technique for skin that feels soft and smooth, and looks younger and brighter. Total time: 5 minutes to make, 10-15 minutes to relax while using. Instructions: Whisk together all oils, then use your spoon to mix in the mashed avocado. Mix until fully combined. Apply to face and let sit for 10-15 minutes. Rinse and glow! Which Beauty Oils Are Best for an All Natural Skin Care Regimen? The best beauty oils for all natural skin care are the pure, cold-pressed oils from the seeds, nuts, or fruit of various plants, also called carrier oils. These types of oils are full of fatty acids that replenish lost lipids and seal in moisture. Before you begin your all natural skin care journey, it’s important to know the difference between carrier oils and essential oils. Essential oils are volatile aromatic compounds made from the fragrant parts of plants such as bark, leaves and stems, and peels. Carrier oils are natural vegetable oils that are safe (and beneficial) for direct application to skin. Applying essential oils neat (undiluted) directly to skin can cause irritation and in some cases, even burning. Jojoba Oil: Lightweight and fast-absorbing, jojoba oil is a superstar in the all natural skin care world because it leaves skin feeling soft and smooth with no greasy residue. Of all the beauty oils, jojoba oil most closely mimics the sebum our skin naturally produces. Regularly using jojoba oil in your all natural skin care regimen can help keep pores clear by discouraging natural sebum from hardening and clogging pores. Sweet Almond Oil: Sweet almond oil is cold-pressed from the seeds of the very same almonds that make a tasty snack. The high vitamin E content of sweet almond oil is a noteworthy addition to any all natural skin care routine, but especially when it comes to sun damage. Vitamin E is an antioxidant that helps protect skin from free radicals and sun damage as well as help lessen the appearance of fine lines, wrinkles and age spots. If you spend a lot of time in the sun, using a vitamin E-rich oil in your all natural skin care routine is a must. Rosehip Oil: Rich in antioxidantsvitamin A and vitamin C, rosehip oil is another stand-out beauty oil for giving your skin extra TLC when it comes to spending too much time in the sun. Vitamin A, (which is what topical retinoids are made from) is especially good for oily and acne-prone skin. With its high vitamin A content, rosehip oil is a superb addition to an all natural skin care routine for a clearer complexion. You may have heard of argan oil for hair care, but the high fatty acid content and nutrients also help improve skin elasticity. Argan oil is especially useful in all natural skin care systems designed for aging and postmenopausal skin. Avocado Oil: Mashed avocado has long been a staple of DIY face masks in all natural skin care. Avocados (and avocado oil) is rich in nutrients including omega-3 fatty acids, vitamins A, D, and E plus potassium and lecithin, what’s not to love? But Do I Really Need An All Natural Skin Care Plan? Consider this: Our skin is actually the body’s largest organ. In fact, adults can carry approximately 8 pounds and 22 square feet of it on their body! When you think about it, that’s a lot of anything to be stuck with for the rest of your life. Maybe you’ve struggled with finding good quality, accessible all natural skin care products within your budget. We’ve all been there and we’ve all grabbed a cheap drugstore lotion in a pinch, but your skin deserves so much better. Think of all natural skin care as investing in your skin’s future. Natural ingredients and all natural products can help keep your skin from showing early signs of aging for age-defying timeless beauty. Can your cheap drugstore lotion do that? Experiment with using beauty oils for all natural skin care and share your thoughts in the comments!